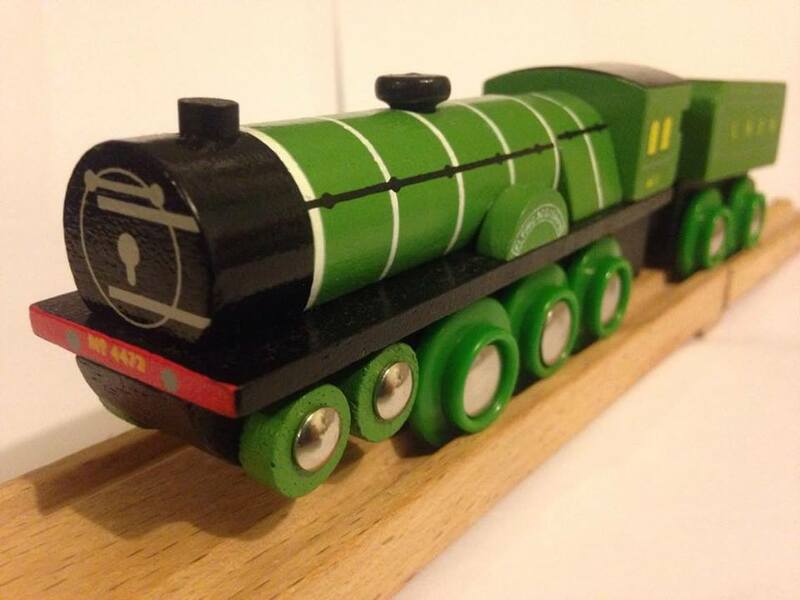 Thursday will see Flying Scotsman make her inaugural run between London Kings Cross and York and to celebrate this run BigJigs have kindly sent there model of her to review. So without further adieu. 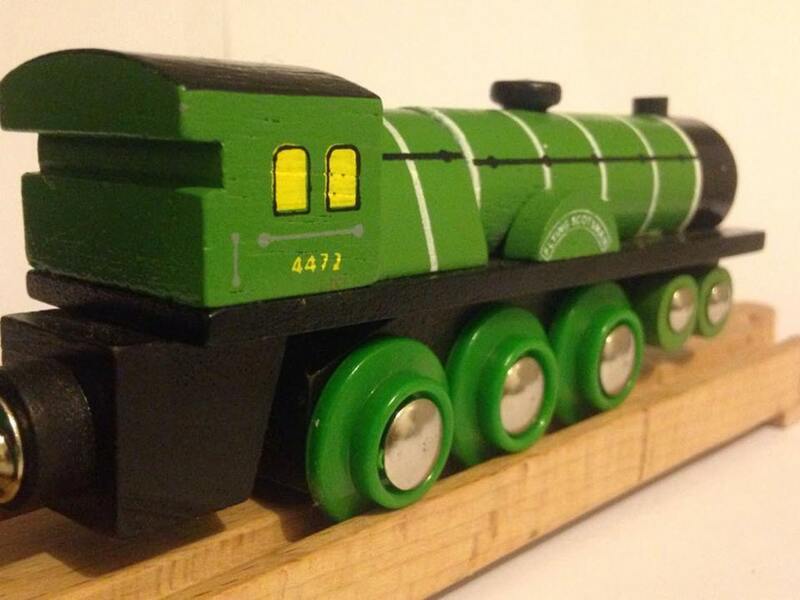 In terms of the overall looks of Flying Scotsman, BigJigs have done a great job with the shape. This is down partly to the A3’s having a quite simple shape compared to the more complex lines of locomotives such as Sir Archibald Sinclair and the Class 25 ‘957’ which are also featured in the BigJigs Heritage range. Flying Scotsmans boiler looks great, the shape of the cab is spot on, but the tender being undersized does stick out more noticeably then on the other models. The only other downsize is the missing set of wheels which should be under the cab, but this is another compromise that had to be taken as not to affect the overall running and play quality. 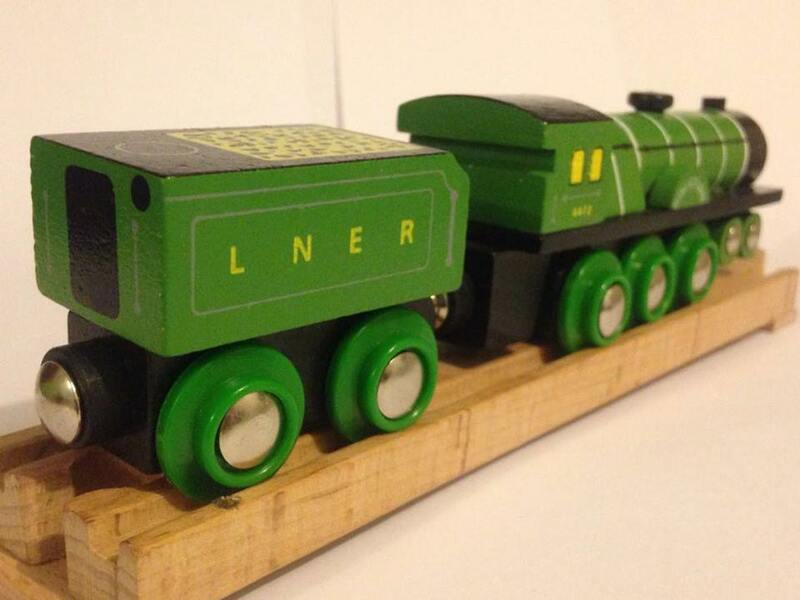 The biggest difference between the real life locomotive and the model is that Flying Scotsman has recently returned to steam in her BR Brunswick Green livery however the BigJigs version has been painted in the LNER Apple Green livery which is far more recognisable to the general public and arguably her most iconic look. I can’t knock any points off for this as I would have done the same if I was in there shoes. Flying Scotsman has some great detailing on her, with the highlight being the nameplate above the central driving wheel which that look very clean and crisp. She also has painted on handrails on the sides, both her number on the cabside, painted and detailed bufferbeam and a fully detailed smokebox. In terms of detailing this is the best from BigJigs and it is easy to see why it is one of their best sellers. 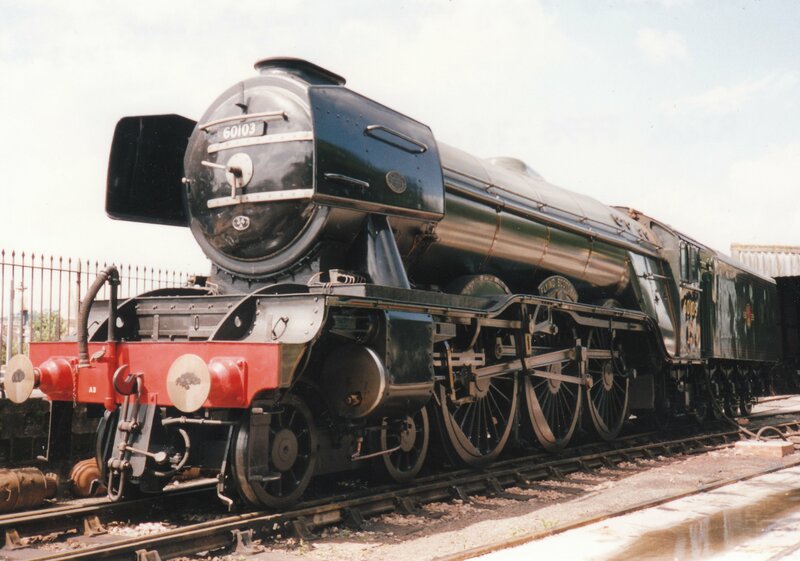 The first thing I did notice was unlike other locomotives in the range such as Tornado and Sir Archibald Sinclair she had her roof painted black which was something that was missed on the other two. 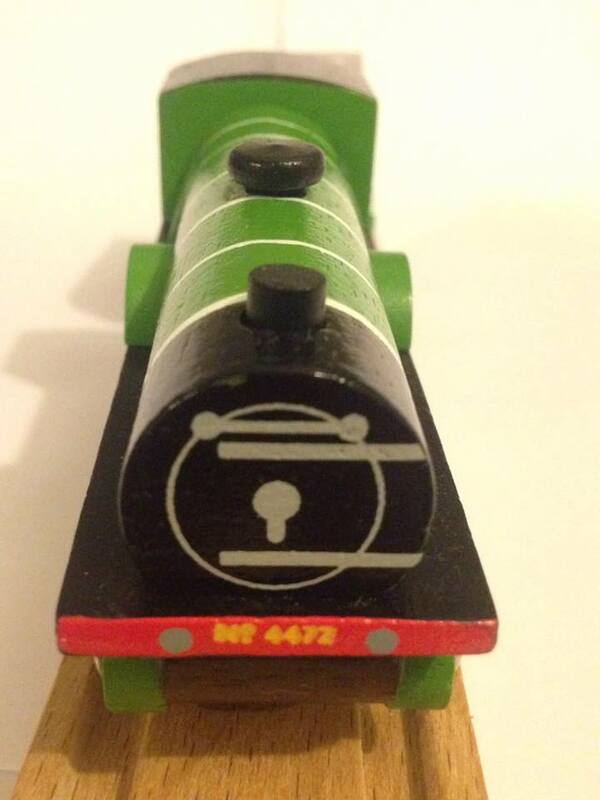 My favorite piece of detailing on the model was actually on the tender where BigJigs took the time to include the corridor connection which is a nice little addition that makes the world of difference. The first part of this review was looking at the model from a railway enthusiast’s view-point and a good percentage of people buying these trains will be granddads or dads (like myself) who are enthusiasts and want something a bit more special than the typical generic wooden trains you usually find on the market. The next part of this review is a bit tricky because as a 27-year-old man I felt I wasn’t the best judge when it came to play quality and its durability. This meant I had to call in not only my 5 and 1-year-old kids but also my 8 and 3-year-old nephews to test the locomotive. In order to get a fair overall assessment of the play quality I gave the locomotive to my kids and nephews for a week and then asked what they thought. All the children loved playing with the locomotive as when I showed them the train for the first time the real life Flying Scotsman was being featured on a news article on the television so they were really excited to be playing with the ‘famous train’, Like the other tender locomotives I have reviewed the children were able to grip the locomotive with their whole hand, so were able to push it around at a fast speed. This isn’t possible with some of the smaller trains as they tend to only use a couple of fingers to hold the locomotive, which means it derails easily when it goes fast. With the Flying Scotsman also being tested by my 1 year old, the locomotives durability and quality would be tested to the extreme! After a week I had a look the locomotive to see if I could see any defects and the only thing I did notice was that a bit of paint had come off the edges on the locomotives coupling to the tender. The rest of the locomotive performed faultlessly which is made more impressive given that it was tested far more intensely by the children than the other locomotives because of its fame. Overall the locomotive performed very well and Flying Scotsman has made a great attempt to be the best model in the range. She captures the looks of the real locomotive brilliantly and is tough to survive the roughest of play times. 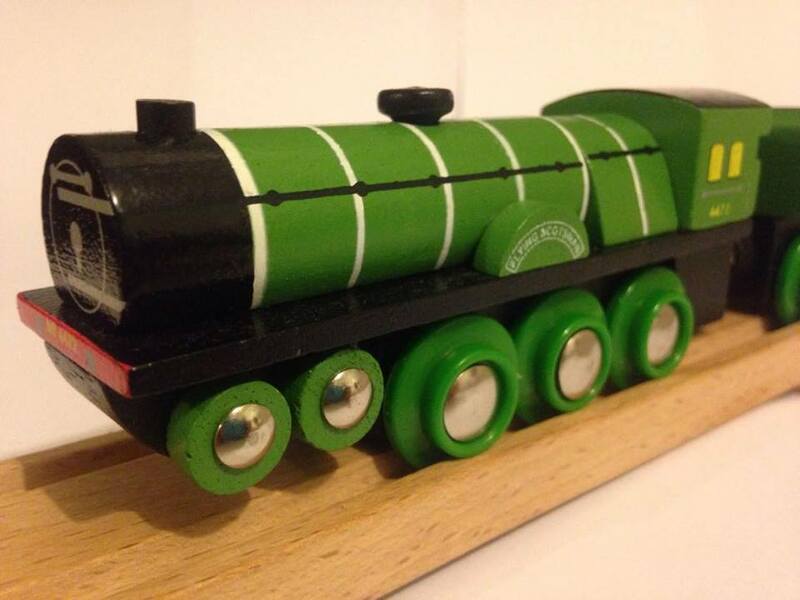 The model has done BigJigs proud and has inspired the children to want to go and see the real version in steam. Traditionally we don’t mention where to purchase products we review, but with Bigjigs I have made an expectation. This is because orders placed on the Bigjigs Toys website are mostly fulfilled by independent toy shops based on their stock levels and geographical location. By purchasing from the website, you are helping to support your local high street and, more importantly, your local toy shop. I was actually chatting to a shop owner in Winchester who stocks Bigjigs products who told me he gets lots of orders he wouldn’t have got without the Bigjigs website.